To get the ball rolling we have a few recent images from Al Kelly. His full collection of images can be found here: Al Kelly's Astrophotography website. As this section of Astronomy Today develops we'll feature more of Al's images. 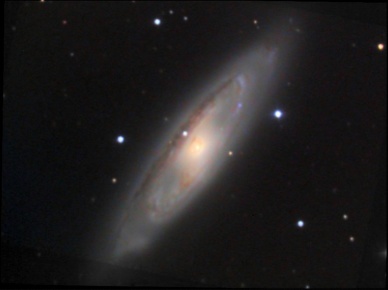 Al Kelly's image of spiral galaxy M65 in Leo, composed from images taken with a Starlight Express MX916 and a 32" f4 Newtonian on 2nd March, 2006. The images were captured in Danciger, Texas, using Schuler RGcBc filters. Technical details: Four 240-second unfiltered exposures, four 90-second subexposures in red, three 90-second subexposures in green, and five 90-second subexposures in blue were self-guided in Astroart and processed in AIP4WIN and Photoshop. All images were binned 2x2. 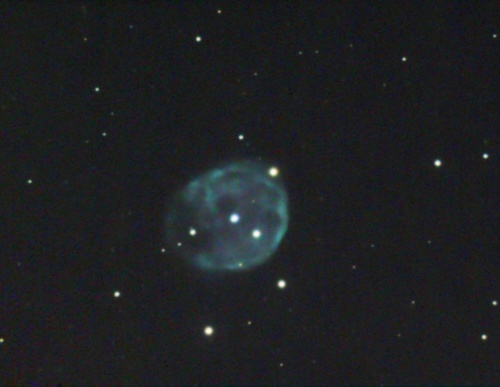 Al Kelly's image of planetary nebula NGC 246 in Pisces, composed from images taken with a Starlight Express MX916 and an 8" Schmidt-Cassegrain telescope. The images were captured on 3rd November, 2005 at the Eldorado Star Party (near Sonora, Texas), using Schuler RGcBc filters. Technical details: Fourteen 300-second unfiltered subexposures, seven 300-second subexposures in red, six 300-second subexposures in green, and eight 300-second subexposures in blue were self-guided in Astroart and processed in AIP4WIN and Photoshop.